Scenic Drives – amazing journeys to unique destinations! Whether it's racing through the Carpathian Mountains or ambling along the Danube River, Romania offers countless picturesque views from the road. 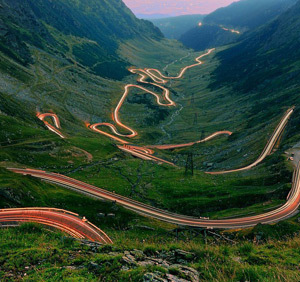 Romania's national roads network cannot rival the US Interstate Highway system but the Transfagarasan and TransAlpina, two unique thoroughfares over the southern Carpathian Mountains are part of any list of the world's most amazing roads. 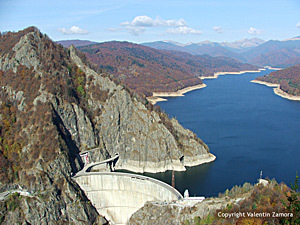 Other scenic drives in Romania include: the TransBucegi, Pasul Rucar – Bran, Pasul Turnu Rosu (Valea Oltului), Pasul Buzaului, Defileul Jiului, Valea Cernei, Valea Bistritei Aurii, Pasul Tihuta, Cheile Bicazului and TransSemenic. 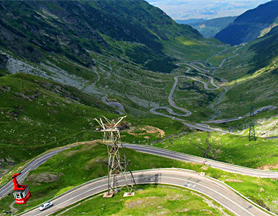 Also labeled "the Road to the Sky", "the Road to the Clouds", "the Best Driving Road in the World" and even "A spectacular Monument to Earth-Moving Megalomania" the TransFagarasan climbs, twists and descends right through Moldoveanu and Negoiu - the highest peaks in Fagaras Mountains and in Romania. This is no pass through a gap but a frontal assault, a stark and spectacular reminder of unchecked power stamping itself on an obstreperous landscape. 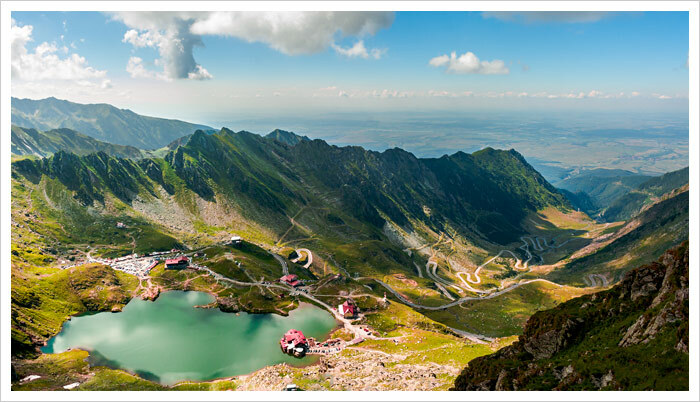 Also known as the "Transylvanian Alps", the Fagaras Mountains are rich in unique wildlife and scenic hiking and biking trails. 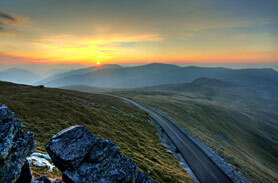 If adventure and Alpine scenery sound alluring, the TransAlpina road offers an ideal mix of the two. Winding its way through valleys and plateaus up to 7,038 feet – a height not reached by any other mountain passage in Romania – the TransAlpina road offers breathtaking views together with lots of driving excitement. Arguably the oldest road over the Carpathian Mountains, TransAlpina was built at the beginning of the 2nd Century AD by the Roman legions during their war campaign to conquer Sarmizegetusa – the capital of Dacia (modern-day Romania). Sinaia is home of the stunning Peles castle but if, while in or near town, you will feel the need for higher elevation, even fresher air and sweeping landscapes you can soak in some of Romania's most breathtaking vistas without even leaving your car. 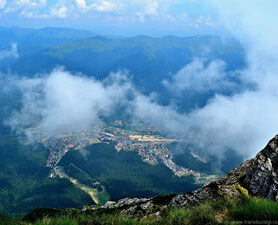 Just take the TransBucegi road from Sinaia to the Bucegi Mountains Plateau. This beautiful cul-de-sac road will lead you to Bucegi Natural Park, a land which provides colorful flower and foliage displays as well as numerous hiking trails, that will lead you straight into the heart of nature. There are many aspects of Transylvania that make it a popular motorcycle tourist destination; the challenge of constantly twisting roads and sparse traffic being two. Another is the availability of local motorcycle tour guides. As interesting as towns and architecture can be, it is the people I met who provided me with the variety of character that brings it all to life. Across from the Imparatul Romanilor hotel, Zed spotted a purple Harley parked in front of the Transylvania Tattoo Parlor. Curiosity, not being the sole domain of cats, led us to introduce ourselves and that led to more tales of motorcycle culture in Transylvania courtesy of Ovidiu, master tattoo artist and Harley partisan. 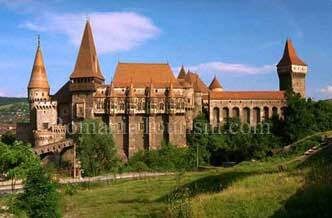 A one-day round trip from Sibiu to Hunedoara rewarded us with a visit Gothic-style Corvinilor Castle built in the 14th century, where Dracula was imprisoned for crimes against the Turks. By now the heat was having its effect, and it felt much better to ride. So ride we did, south to Petrosani and then east along a very narrow, twisty, mountainous road to join up with the northbound Transalpina highway back toward Sibiu. The altitude gave us a much cooler ride. Although the Transalpina highway was declared open, it is far from finished. It is not so much of a problem for cars, but the unpaved, crossroad culverts can come as a surprise to a motorcyclist, particularly if one is appreciating the wonderful scenery when you should be looking forward. Quite exhausted, we got back to Sibiu for our second night at the elegant Imparatul Romanilor hotel. Our final day of riding was the 56-mile Transfagarasan pass that links Transylvania to Walachia and climbs to almost 7000 feet before passing under the mountain peak through a half-mile tunnel and down the other side. The BBC television show Top Gear called it the best road in the world, and the featured section on the north side of the pass is quite wonderful and exciting by any standard. I have no idea if Dracula ever made it over this pass. But I am glad to say that I did, and I enjoyed every rising foot of it. The down side of the pass is longer and travels along the Arges River and the 6.5-mile-long Vidraru Lake through forests, and as such lacks the sheer vistas of the north slope. But it is an engaging road that will keep you amused and, depending on skill level, challenged. Just as I was wishing for somewhere to stop, we arrived at a watering hole without which I might have ridden right past the last of Dracula's castles and the one that firmly established Vlad the Impaler as Eastern Europe's most feared leader. Poenari Castle, considered to be the authentic Dracula's Castle, sits on top of a peak that is impossible to see if you are traveling south. 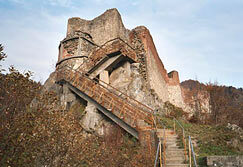 The parking lot at the base leads to a 1480-step staircase to the castle. After six days, almost 900 miles, plenty of memories and Poenari behind us, our six-day quest was almost over. All that was left was the 100-mile ride to return to Bucharest to spend one more day enjoying the remarkable city that is spearheading Romania's transition from repression to freedom. So many roads to ride and so many reasons to put riding Romania on your bucket list.